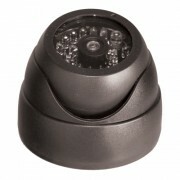 This is a mini dummy camera made to look like a real infrared dome surveillance camera. 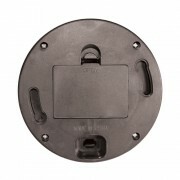 It has a red flashing light to help deter any criminal activity. 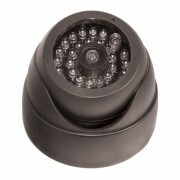 This Fake Infrared Dummy Dome Camera w/ Red Flashling Light can be delivered in 3 to 5 business days. If you would like to receive your order sooner, guaranteed 3 day, 2 day and next day delivery options are available upon checkout. Orders placed by 2:00 PM central time ship the day they are placed. If you have any questions or concerns call our customer support staff at 800.960.2015 or click the live chat button at the bottom of this page. Our courteous and professional customer support team is always glad to help!